Telegana Government has launched a new initiative to provide financial assistance to the single woman of the state. It is the first initiative of its kind in India. Under this Single Women Pension Scheme, every single woman of the state would receive Rs. 1000 per month. The government will provide the pension to 36 lakh beneficiaries of Telengana . According to the Govt the divorced or deserted 'married' women having age above 18 years would be regarded as 'Single woman'. Similarly the unmarried woman of age above 30 years in rural areas and above 35 years in urban areas, who are separated from their family, will also be as 'Single Woman'. The Telengana Govt. 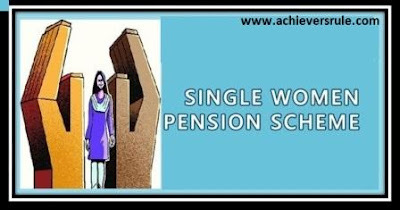 has issued some guidelines to implement the Single Woman Pension Scheme. The annual income of the beneficiary should be less than 1.5 Lakh in rural areas and Rs. 2 Lakh in urban areas. She should not avail the facility of any other social pension scheme. A single/ divorced woman who has no support from family would get the pension. As well as, the women, who are deserted by their husbands, are also eligible to get the benefit of this scheme. The separation period should be more than one year. In case the documents supporting the separation are not available, the essential inquiries must be done by the local officials. Every single woman of state Telengana must be eligible to get Rs. 1000 per month. Women with age more than 65 years will get the benefit under old-age pension Aasara scheme. If the pension holder remarries or achieves financial stability or gets any permanent jobs, the benefit of this scheme must be discontinued for them. Various Govt. officials would check the eligibility of the beneficiaries after every 3 months. The Mandal Parishad Development Officers (MPDOs) would perform this job in rural are-as while Municipal commissioners must handle the urban local bodies. The issues in GHMC( Greater Hyderabad Municipal Corporation) areas other than Hyderabad must be handled by the Deputy Commissioners. The applications must be verified by different Govt. officials in case of rural and urban area. A 10% super check must be performed by the District collectors. If any wrong information and certification by the beneficiaries is found, there must be strict disciplinary action against the violators.